This is one of our favorite Kickstarter projects seeking funding. An amazing speaker dock with personality! First of all, Shimi is a high-quality speaker dock. And because we love music as much as you do, we packed Shimi (rhymes with "Jimmy") with high quality 6 Watt speakers and optimized his shape for best sound quality. But that’s just the beginning. 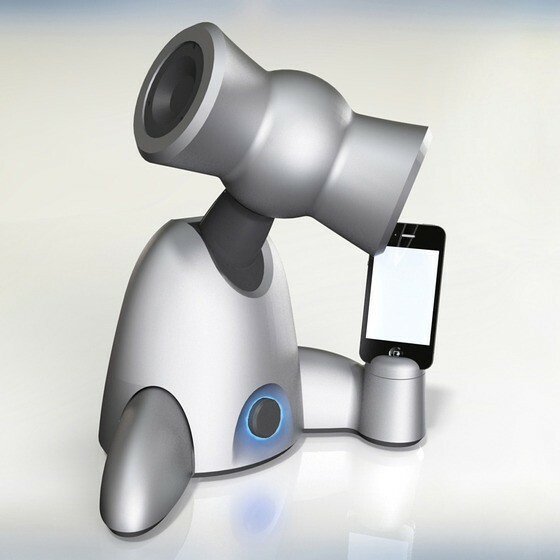 Shimi doesn’t just play music, but actually uses your iPhone as his brain to become your own personal robotic musical companion. Not only does Shimi love to move to the music, but he knows and understands what moves you. Shimi has five motors strategically placed, and will dance to the beat of any song using a rich variety of dance moves that fit the specific song and genre. We packed years of our research in expressive robotic movement into an app that makes Shimi groove like nobody’s business. Using face recognition software, Shimi will always know where you are in the room and point the speakers to you. No matter where you are, Shimi will always deliver the best stereo sound to you. Shimi uses natural language processing to understand and respond to your musical (and other) requests. Shim also uses sophisticated music intelligence algorithms to understand and respond to your rythmic taps and claps and select music with the same rhythm and tempo. We will keep developing new applications for Shimi. We are already working on applications that will allow Shimi to respond to your facial expression, learn your musical tastes, and recommend new music to you. Expect apps for gaming, education, music making, tele-presence and more, very soon. We are also developing an API to let third-party developers make apps for Shimi. We are a team of roboticists from Georgia Tech, IDC, and the MIT Media Lab, working together for several years in academic settings. We have managed to put together a rockin’ prototype that knocks everyone we show it to off their feet. Even after thousands of hours of developing and demoing Shimi, we still can’t help bobbing our heads and smiling when Shimi starts moving. In order to be able to share the magic of musical robots with the world, we need to make this prototype into a real product that can be manufactured for a reasonable price. We also want to know if there are enough people out there who want one at home as much as we do. For that we need your help: if you back our project at the $149 reward level, you will receive one of the first commercially available Shimi robots at a price well below our expected retail price. 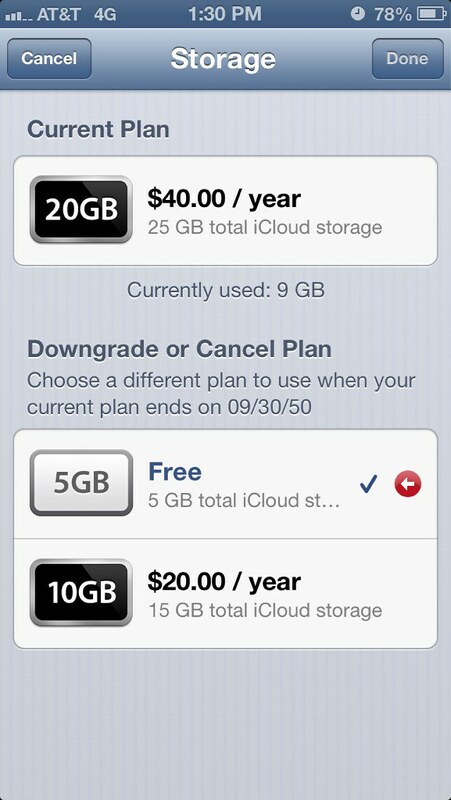 iCloud Storage for MobileMe Customers Set to Expire in 2050? Former MobileMe customers are noticing that their free additional 20GB of iCloud Storage is being set to expire in 2050, reports TUAW. Twitter user @mgleet tipped me off that Apple appears to have bumped his iCloud storage plan to 25 GBs until the year 2050. Multiple people here at TUAW are seeing the same plan bumps, though none of us has upgraded our plans, not to mention paid 38 years in advance. A week ago Apple sent an email to former MobileMe customers letting them know that their 25GB of cloud storage space will be reduced to 5GB unless they upgrade their iCloud. That downgrade was supposed to happen yesterday. 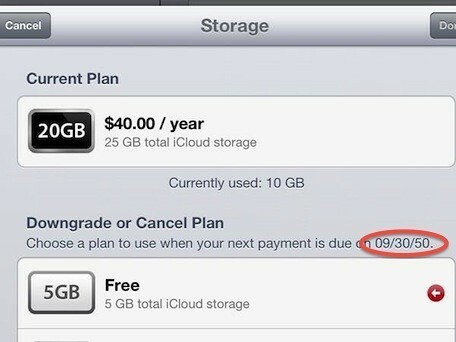 Are you seeing an expiration of 2050 on your additional iCloud storage?